Although the palace is now thoroughly embedded within the city confines, it’s important to remember that for most of its life it was a country retreat, located well outside the city walls. 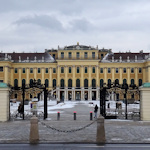 In the mid-13th century, the area around Schönbrunn — the present day district of Hietzing — all belonged to the Klosterneuburg Monastery (which still exists; Klosterneuburg is a small town along the Danube river west of Vienna). It was a wine-growing area with a small village untroubled by urban development. The Katterburg — a small castle estate with its own mill — stood on the land now occupied by the palace grounds. This was purchased from the monastery by Emperor Maximilian II in 1569 and the land stayed in the hands of the Hapsburgs until 1918. Maximilian turned the Katterburg into his own hunting estate, but included fish ponds and collections of some exotic birds. Thus began a tradition which would eventually lead to the establishment of the world’s oldest public zoo. His successors didn’t do much with the place until it attracted the special interest of the second wife of Emperor Ferdinand II, Eleonore of Gonzaga. After his death in 1637, the now stepmother to the current emperor (Ferdinand III) retired to the Katterburg to live. In 1642 she had a new hunting lodge built for her. The new building picked a bad century to go up though. Vienna had narrowly survived a first Turkish invasion in 1529 and the Turks returned in 1683 to lay siege to the city once again. Those behind the city walls held out until rescued by an army led by the Polish king, Jan III Sobieski. Those outside the walls weren’t so lucky; Schönbrunn was destroyed. Trivia: the Turkish invasion wasn’t all bad news – they left behind their coffee, thus (allegedly) sowing the seeds of the great Viennese coffee house tradition. Schönbrunn’s rebirth began in 1696 when construction work began on a brand new palace (really a hunting lodge). The baroque architect responsible was the Austrian Fischer von Erlach. He’d had a first set of somewhat over-ambitious plans “rejected” a few years earlier, but won approval and — more importantly — the commission from Emperor Leopold for the second set. Von Erlach was one of the great architects of his time, responsible for other great Viennese buildings like the Karlskirche, Palais Schwarzenberg and the Winter Stables for the Spanish Riding School (though his son often completed the actual construction work). Alas, Von Erlach’s plans never reached full fruition. The hapless Charles II, King of Spain, inconveniently died childless in 1700, leaving the French, his Hapsburg relatives and various other European powers to squabble over the throne. The War of the Spanish Succession resulted, messing up Emperor Leopold’s financial planning and calling a halt to construction work at Schönbrunn. Tip: If you take the Grand Tour of the palace, the final room on the tour has a painting of a hunting scene, and in the background you can see how the original van Erlach-designed lodge looked before the subsequent rebuilding work. It was some 40-50 years later that the palace achieved its full glory, thanks to the drive of Empress Maria Theresia. Until her reign (which began in 1740), Schönbrunn had always been an occasional summer retreat or dowager residence. But Maria Theresia turned it into her preferred full-time summer residence. So from 1742 onwards until the late 1770s, the palace and its interiors were expanded and transformed into its current complete form. Despite the delay in completing the work, the architects relied heavily on von Erlach’s original designs (the architect himself had died in 1723). The plans were, however, modified and expanded by Nikolaus Pacassi, the court architect who managed the building works for the Empress. As a result, von Erlach and Pacassi get joint credit for the palace. By the late 1700s, Schönbrunn stood pretty much as it does today. The only major exterior change was to the facade, which gained its distinctive yellow coloring just prior to 1820. Most of the later work went on inside the palace, with extensive refurbishments and changes accompanying, for example, the accession of Emperor Franz Joseph in 1848 and his subsequent marriage to Elisabeth in 1854. The imperial couple were the only royals after Maria Theresia to make Schönbrunn their preferred summer residence (though Elisabeth spent much of her time away from Vienna and the constraints of court life). After the end of the monarchy in 1918, Schönbrunn passed into state ownership. It’s now managed by a limited company, though one wholly owned by the Republic of Austria.